Automatic Rotary Numerator allows automatic marking of consecutive serial numbers on metal parts. The figures progress one by one on this Automatic Rotary Numerator works making strong impression. 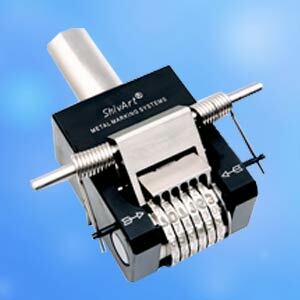 The Automatic Rotary Numerator is a simplified operation for marking numbers. The Automatic Rotary Numerator can be used to mark consecutive serial numbers on metal parts by a simple operation. The special design of this Automatic Rotary Numerator ensures that figures advance one at-a-time accurately and automatically. Impressions are perfectly aligned, evenly spaced, uniformly deep and part after part. Applications : Name-plates for Electric Motors, Pumps, Meters and for engines, Bicycle, Frames, Keys, etc.